IMM Tending - Injection moulding machine tending in collaboration mode. 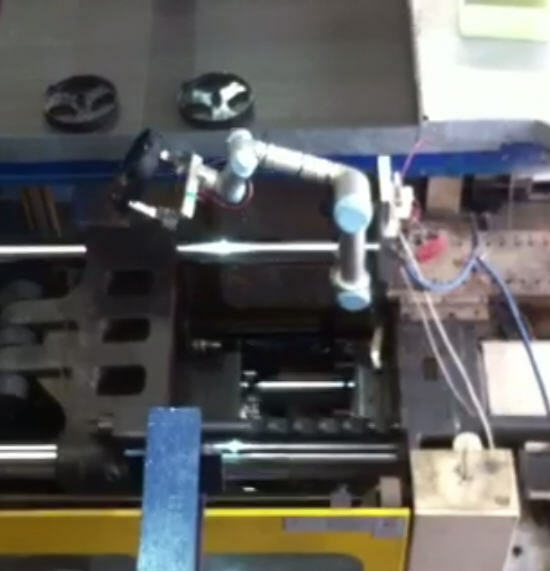 Universal-Robots REDUCES COST, OPTIMIZES PRODUCTION AT INJECTION MOULDING COMPANY. IMM - Injection Moulding machine tending application. Increase throughput and at the same time decrease production cost with Universal-Robots. After a Universal-Robots UR5 was installed on an Injection Moulding Machine (IMM) in Brisbane near the Gold Coast in Australia the manager exclaimed ! Production Manager - Injection Moulding Facility - Gold Coast - Brisbane Australia. The background for this statement is with the previous workflow and process time in mind for the Injection Moulding machine. This moulding process takes about 10 minutes to complete and the items produced needs to be removed from the ejector before the Injection Moulding machine can proceed to next cycle. In the past an operator performed this task of removing the newly prodced item and restarted the cycle, and in order not to waste opperator time (when the operator did not have to tend the moulding machine) then the opperator in the mean time tended to other tasks for example packing items into boxes. But these work tasks were not in sync and therefore either the moulding machine was waiting to get the proceed work piece removed because the operator was still busy and would finish a batch of packing tasks - or the operator was waiting for the moulding machine to be finish – therefore there was waste of time. The Injection Moulding machine company was looking for an automated solution and after researching the market they purchased the Universal-Robots from Zacobria Pte. Ltd in Singapore. This solution prove to work good because the company have own very skilled technical engineers who normally do the in-house installation, commissioning and integration with the Injection Moulding Machines. After a brief remote training and clarifications of small technical details the company’s own engineers were capable to perform the implementation them selves. So now a Universal-Robot has been installed on top of the Injection Moulding Machine with signal exchange between the machines - so the process of ejecting the freshly made work pieces - is now performed by a 6 axis Universal-Robot. This means the robot will tend and remove the work piece immediately when the work piece is ready and the moulding machine can restart immediately after the robot has removed the work piece. Therefore the Injection Moulding machine has minimum idle time in fact as little as physical possible before proceeding to produce next item. And on top of this there is no need for an operator to be located at the moulding machine because the Universal-Robot is also controlling the take away conveyor seen in the video next to the injection moulding machine. Furthermore the operator can now fully focus on new tasks for example packing of items without being interrupted by the need for tending the moulding machine. Therefore the Injection Moulding Machine is now working to full capacity and producing as many new items as possible and at less operational costs – this is already a big benefit because more is produced at less cost – and on top of that the operator can also do more of his other tasks. The robot has even got its own name and T-card in order to measure the performance and this has been very successful and the ROI (Return of Investment) has been as short as 6 months. This is true Increased Productivity. One of the reasons the Universal-Robots is so easy to implement is that the Universal-Robots are equipped with a force sensing mechanism that detect unexpected obstructions and tested according to international standards. This means the Universal-Robots will stop if it meets a force according to the standard and therefore the robot can work in collaboration with its surroundings. A thorough risk assessment must however always be made. This Injection Moulding Company is located in Brisbane in Australia and provides its customers with high quality consistent solutions to their plastic moulding needs. In achieving this we will provide standards of service which will be considered the benchmark in the industry. Customers, staff and suppliers will be valued as integral components to the success. Zacobria Pte. Ltd is a Singapore based accredited Universal Robots support Centre and Forum and authorized Robotiq and MiR distributor. Zacobria is capable of manufacturing end effectors and designing and implementing the entire robot solution. With these different packages in many situations the implementation is very rapid because the total solution can be in form of a packet that is very fast to integrate with other systems. In some situations it is possible to get a robot solution to work for you within the same day of robot purchase.